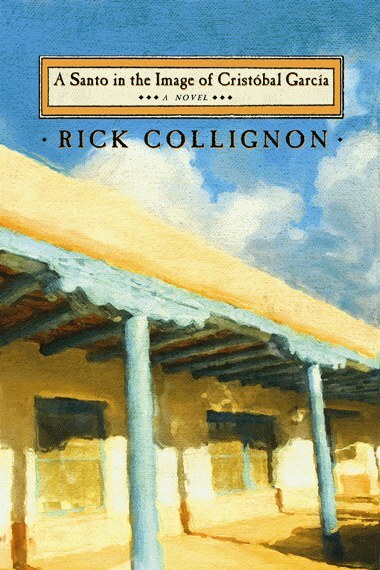 Rick Collignon brings us the entire history of the magical village of Guadalupe, New Mexico — from the long ago winter when it was established by a solitary madman making tiny houses in the snow to the moment when it is inexplicably set afire. Flavio Montoya returns as the aged scion of his family, still tending his dead sister’s fields and wondering how all of his family could have died before him. When the villagers accuse him of starting the fire, it becomes one more mystery that the simple Flavio must fold into his history, though he cannot quite understand it. A Santo in the Image of Cristóbal García is a beautiful, funny, and even epic story of how all history is finally personal. THE MORNING THE MOUNTAINS CAUGHT FIRE and the village of Guadalupe began to burn, Flavio Montoya was once again standing beside the irrigation ditch behind his sister’s house. “This field is turning to dirt,” Flavio said, and then he turned his head and looked at the foothills. There had been no moisture in Guadalupe for four months, and the hills were dusty and too dry. The trees had grown faded and listless as if they had forgotten altogether what rain was. There was a shadow moving between the piñons, and Flavio thought idly that it seemed too large and moved too haphazardly to be a deer. It was just past dawn, and the sun was still far below the mountains. Flavio had been trying to irrigate Ramona’s field for the past twelve days, and he had come to wonder how such a simple chore as moving water, a thing he had done all his life, had suddenly become so difficult. While it was true that there had been no rain for months, it was also true that the ditches in the village were running full from the heavy snows the winter before. More than enough water to keep the fields wet. Where the ditch ran, the alfalfa was green and sturdy, but stretching away from it was cracked earth and a scattered army of stunted yellow plants. And although the drought and the harsh spring winds were much to blame, Flavio knew that he, too, was at fault. Each morning, long before dawn, Flavio would come to the field. But after just a few minutes of digging, he would tire and then stand motionless with his shovel as if both were spaded in the ground. He would stare blankly at the dark shadow of the mountains or at the back of Ramona’s empty house with its small curtained windows and think about nothing. And then, suddenly, as if there were no such thing as time, he would wake and find himself standing in the heat of the sun. Then he would walk slowly to his truck and drive home. This morning, the morning Flavio saw the shadow of Felix García moving between the piñons and the morning Guadalupe began to burn, Flavio and his shovel were again standing quietly beside the irrigation ditch. He had once again forgotten how dry his sister’s field was, and staring absently at the foothills, he remembered the time his Grandmother Rosa told him that Demecio Segura had been born into a snowbank.